Home improvement is something most home owners get excited about. There are so many ideas ranging from crafting and building to shopping and construction. Through social networking sites, homeowners are able to broaden their knowledge and get help with projects without spending thousands on professionals. Along comes Hometalk to gather those homeowners and their ideas in one place. Hometalk targets home improvement on a global level. Like watching home makeover shows on television, Hometalk provides a place to showcase inspiring projects, facilitate ideas in DIY’ers and watch improvements take shape. Unlike television though, Hometalk also delivers help when a project or improvement becomes troublesome. Hometalk’s purpose is to provide a place where users can share their home and garden ideas and help others who need it. 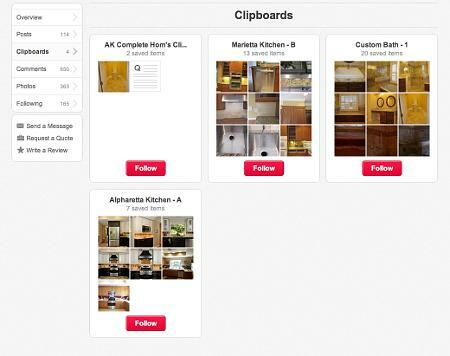 Hometalk is built around topics which are sorted by area such as ‘Bathroom’, ‘Outdoor Living’, ‘Gardening’ and others. Within those topics, users can post about success stories and ask open questions via ‘Post’ and ‘Ask’ buttons respectively. The search feature was more than adequate with the ability to filter results by Posts, Photos, Members, Professionals or Zip Code. Through several searches, we found a very involved community willing to provide assistance like a message center and genuinely engage with others about their projects. If you’re familiar at all with social networks, then Hometalk will feel like second nature. Similar to most social sites, users can follow each other as well as like and share posts. Users can also save posts. Saving is a great way to bookmark projects, ideas and help topics for easy reference at a later time. Though Hometalk does track followers and likes, they aren’t focused on it. Where Facebook fan pages seek likes and Twitter accounts pursue followers, Hometalk casually makes sharing and connecting feel more comfortable and without pressure. 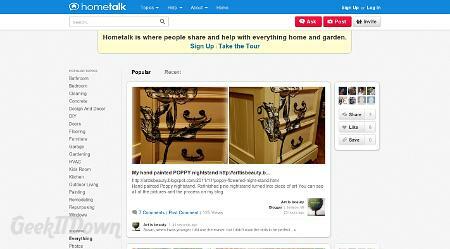 Hometalk sufficiently covers what any DIY type needs through posting and asking questions. When projects get out of hand, users can contact a professional through Hometalk. Businesses/contractors can create a profile, but cannot advertise which keeps Hometalk free of constant in-your-face sellers. Users can request a quote through Hometalk or obtain contact info for communication by other means. The sharp focus of Hometalk means more enriched conversation about topics and less nonsensical noise. Like other interest based networking sites Hometalk relies on its community to grow. Home improvement provokes involvement and with an outlet like Hometalk, users can gain knowledge and flourish in their own projects.